Bride To Be Joanne Says Pie Do! It will be one of those romantic moments to treasure. Newlyweds Stuart and Joanne Booth will tenderly gaze into each others eyes pick up the special wedding cake knife and together plunge it into the three tiers of a 50lb “growler’. 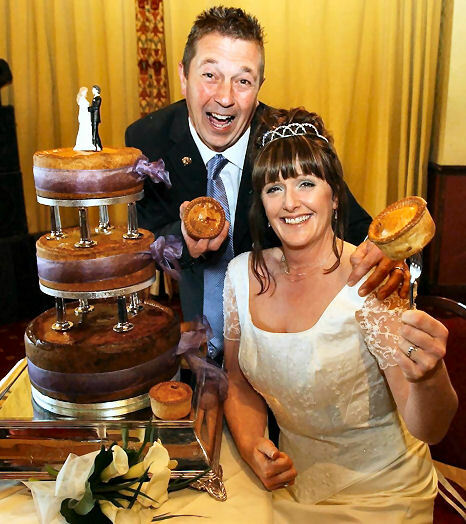 The pair both aficionados of the pork pie will celebrate their nuptials on Saturday with a world first. They and their 100 guests will not be tucking into an iced fruit cake after the reception. Instead they will be treated to portions of a championship-winning pork pie, lovingly baked in Huddersfield and served, of course, with a spoonful of mushy peas. The zany idea is set to be a highlight of the wedding of 45-year-old Stuart, a self-employed builder, and 39-year-old Joanne Robinson, a senior home care worker for Kirklees Council. They are to tie the knot at Huddersfield Register Office and then enjoy a reception at the Pennine Manor Hotel, complete with the three-tier pie. It is being prepared and baked in a five-hour marathon by Simon Haigh and his team of master butchers and bakers at Hinchliffe’s Farm Shop at Netherton champion pie-makers. Stuart, of Ripponden, is along-serving member of the Pork Pie Appreciation Society, based at his local, The Old Bridge Inn. So much so that his wedding has led to this year’s pork pie championships being delayed to April 9. He said: ‘My brother Kevin is the president of the Society and it was his idea to do something so different. 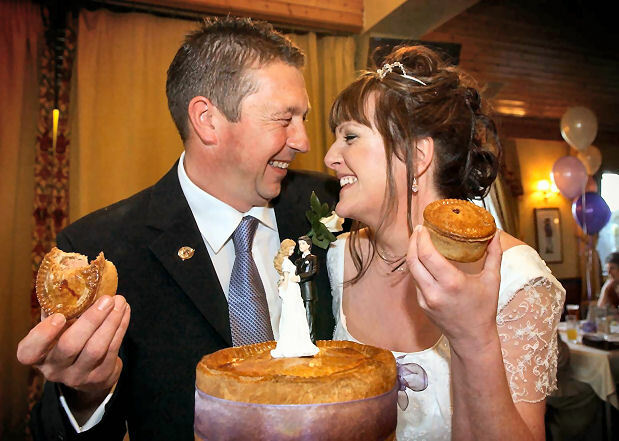 “Both Jo and I enjoy a good pie and a pint and she happened to mention how much fun it would be to have a pork pie wedding cake. Kevin heard about it and said: ‘Leave it with me’. 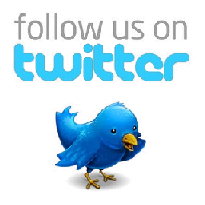 “We have mentioned it to many of the guests and they think it’s a great idea. There is a buffet for the reception, but we plan to serve the pie and peas later in the evening. “We re then heading off on honeymoon to the Lake District and plan a stop off in Keswick, where one of our previous pie champions has a shop. We know we’ll get a good welcome there.” Both Stuart and Jo have been married previously. Stuart has two sons, Andrew and Christopher. Simon Haigh, of Hinchliffes, said: “It’s a tough challenge. We don’t think anyone has tried a wedding cake pie before there is a lot of work involved. “We had a test run and baked a 20lb base pie. It was an ordinary pie, albeit on a large scale, and went down a treat. Let’s hope it goes all right on Friday night when we bake for real”.